« What is Your 2018 Vision? Recently, I shared my thoughts about creating a vision for the future. I delight in planning and setting goals or targets, something on which to focus my attention. I don’t want to aimlessly wander – or squander – the years I have been given to occupy this great Earth. And yet, sometimes, it seems I am doing things without a true investment. Does that ever happen to you? They are those things I think I should do, or that others expect me to do. Where is the joy in that? Shouldn’t the time and energy I invest be directly (or indirectly, at least) bring me joy? Wouldn’t that mean I was doing something I love? Is that being selfish or self-centered? I don’t believe it is and let me explain my thinking here. Sometimes, it may be a bit of a stretch to find joy, happiness, fulfillment, delight or pleasure in what one is doing. The activity or scenario may not be what I expected – or maybe it is what I expected and that was something less than desirable! I believe experiencing the joy or delight in what we are doing circles back to the Vision of who I intend to be. A few years ago, I was a leader in a corporate company and had just completed a 3 day workshop with my management team at one of my remote locations. We had an incredible experience, getting to know each other on a more personal level, building trust and communication to strengthen the leadership team. We looked at how we could work better remotely and addressed the concerns of each leader’s individual team. We created great synergy and high engagement for leading our group to excel in a variety of ways. I was living my intention: Being an effective and engaging leader. Sounds great – right? After the workshop, 5 of us were waiting at the airport for our flight home. My boss calls me on my cell phone and asks me to step away from the group. His message to me: Corporate has decided to close several locations. One of them is mine. The one we are departing from. I need to create a plan to return to this location with him in a few weeks and deliver the news. WOW!! What a kick in the pants! Obviously, my mood quickly sank to a new low. We had just invested so much time and energy in building trust and relationship. It had been one of the best investments of time and money we had spent and I was looking forward to a new year of engagement and growth for my teams and leaders. And now, less than an hour since our celebration lunch, I am to be planning the message that the location will close and my team (and their leaders) would be out of a job or (hopefully) in a new position with the company. I was devastated! I was expected to do something so heartbreaking and really, there was no option or easy answer. How does one even begin to approach this task? Check back on my intention: Being an effective and engaging leader. This is what I really love. Leading others; guiding them to find their way and be their best; knowing that sometimes, that means being direct and tough with compassion and empathy. Laying out the facts, as I know them; being a bit vulnerable, not taking things personally yet, being personable; listen with compassion; allow and encourage each individual to process information in his/her own way; honesty; integrity; truthful. Always breathing and knowing ‘all is well’. My boss and I did return to the location and shared this news with the leaders. Then, we met with the teams and shared with them. Delivery of the message was the easy part. What I mean by that is we prepared a statement and read it. So, once the words were out, we were done with the delivery. It didn’t feel good and I’m sure my voice was shaking – not who I like to be; however, it is my intention in leadership to be truthful and I know that sometimes means being tough and direct. And then – – the range of reactions came. Tears, anger, disbelief, fear, disappointment, denial, thoughtful and questioning. Small group meetings and one-on-ones. Some had to leave the building as they were so distraught. A few simply went back to work, feeling nothing was in their control except what they knew on the job. And me? Here is where I was silently drawn by the strange pull of what I really love: leading others. I breathed in the intention of being leader and what that means for me. I found no joy or delight or happiness in the task I was called to do – announce the closure and disappoint my team. Yet, I found great fulfillment in being there to listen and console and plan and hope with each and everyone. In being leader I did not go astray. Having my clearly defined intention, I was able to shift from the thoughts of cynicism and defiance and what I should do, or that others expect me to do, or the task I was assigned. I became grounded and in control of living the life I envisioned – being the most effective and engaging leader I could be. Others will have expectations of you. Tasks will arise that are unpleasant. All the ‘you should do/be/think…’ comments or thoughts will arise. How do you stay true to who you really are and how you plan to live your life? Be clear. 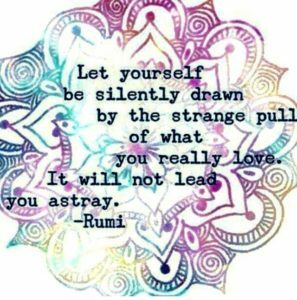 Connect with the pull that is silently drawing you to what you really love. Define your intentions of how you will ‘be’ in this world. Create your vision. Ground and center yourself. Then, breathe it in and take one small step to live the life you said you would live.